When you visit our practice, we want you to feel comfortable and relaxed. With two waiting rooms and a children's area, we have plenty of room for the whole family. Help yourself to cookies or coffee while you wait. With intraoral cameras and digital X-rays, we can easily and accurately gather data about your oral health, without causing discomfort. Chairside monitors allow Dr. Lalonde to share his findings with you and explain his treatment recommendations. For patients who suffer from dental anxiety, we may recommend nitrous oxide (laughing gas) to provide a more peaceful experience. Televisions in each operatory also offer a pleasant distraction during treatment. Before you leave, we will supply hot towels for freshening up after your procedure. Let us know if we can do anything else to make you and your loved ones feel at home in our Los Fresnos dental office. We believe that while healthcare is vital and necessary to your well-being… there's no need for it to be uncomfortable. In fact, it should be pampered and downright enjoyable! That's why we aim for total, complete, VIP, 5-Star Service for you while in our care. 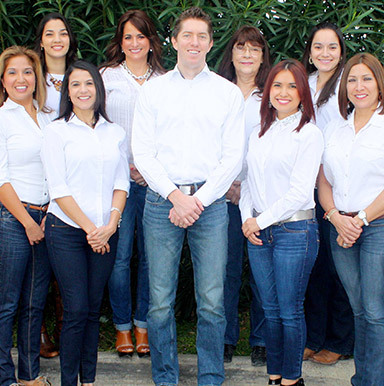 At Los Fresnos Dental Center, your comfort and personalized attention come first.